Leah is 4 months old today! Cliche as it may sound, I can’t believe that she is 4 months already. Where has the time gone? I watch the slideshow from when she was born and it seriously seems like yesterday. When the kids woke up this morning, I said “make sure you tell Leah Happy Birthday! She’s 4 months old today!” The older two ran over and started smothering Leah with love. Ella, my 3 year old, looked at me kind of disgusted and said, “Mama… I think Leah has had more than enough birthdays already!” It has taken awhile, but I think the jealousy monster has finally reared its ugly head around here. Anyway, it took 4 months to finally capture Leah’s smile on camera, but here it is! Of course, we couldn’t do smiles without showing off her more serious side too. Happy 4 month “birthday”, Leah! .-= Nurit – 1 family. friendly. food.´s last blog ..Chocolate-vanilla tea biscuits bars =-. .-= Michelle from Taste As You Go´s last blog ..Addicted to Crack =-. I’m totally jealous. She is utterly adorable! Those cheeks…..toothless baby grin. Thanks for the day brightener! .-= Kate´s last blog ..C is for Corn =-. .-= The Purple Foodie´s last blog ..Crispy Apple Crumble Anyone? =-. .-= Judy´s last blog ..Big and Bold Blueberry Muffins =-. She is so friggin’ adorable! 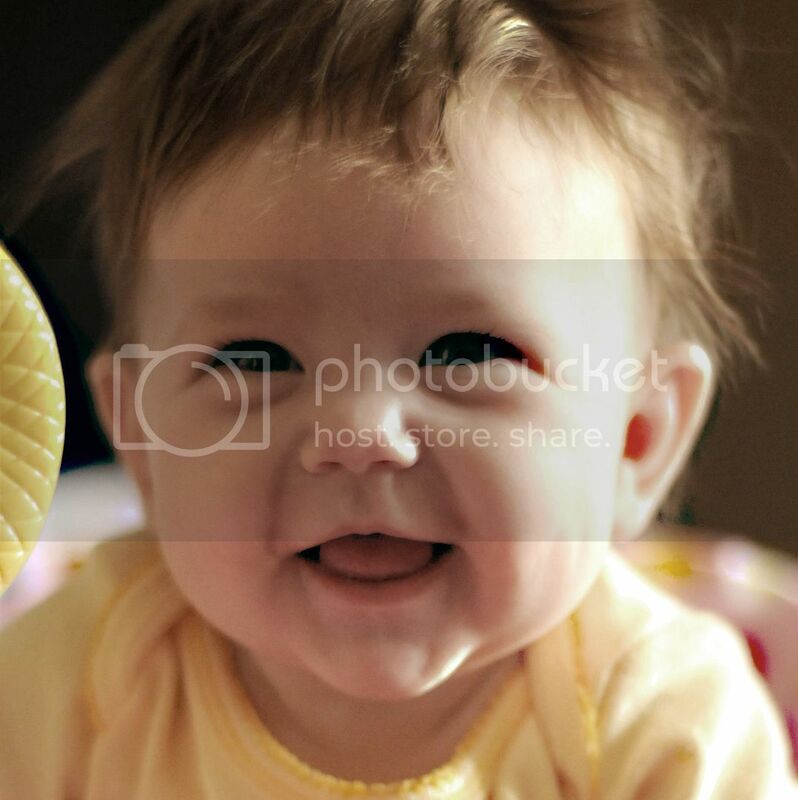 Would love to just pinch her smiley cheeks! .-= alice´s last blog ..Bacon Salted Caramel Pecan Bars Recipe =-. Very cute photo! She is a doll. .-= Kalyn´s last blog ..Recipe for Fattoush (Lebanese "Crumbled Bread" Salad with Sumac and Pita Chips) =-. .-= LyB´s last blog ..TWD – Vanilla Bean Ice Cream =-. She is just SO adorable. .-= Kai´s last blog ..Words are all I have (if I had only 60 minutes left) =-. .-= Jennifer Mullinax´s last blog ..Smith Fest 2009 =-. All of your kids are so photogenic! She’s even changed so much in the last month since I saw her at BlogHer. .-= maris´s last blog ..The Bread Baker’s Apprentice Challenge (Week 12) English Muffins =-. So cute. Time does fly. .-= Amy J´s last blog ..Chicken Cashew Lettuce Wraps =-. love love love love love the photos! .-= lululu´s last blog ..Ragu alla Bolognese (Bolognese Sauce) =-. Not like I haven’t said this a million times before, but she’s absolutely ADORABLE! She’s got those cheeks you just want to kiss! Great photos, Kristen! .-= Sandie ´s last blog ..A Must Make! (Recipe: Snack Mix Bars) =-. Oh my, she is absolutely adorable! .-= HoneyB´s last blog ..Cincinnati Chili in Northern NY =-. 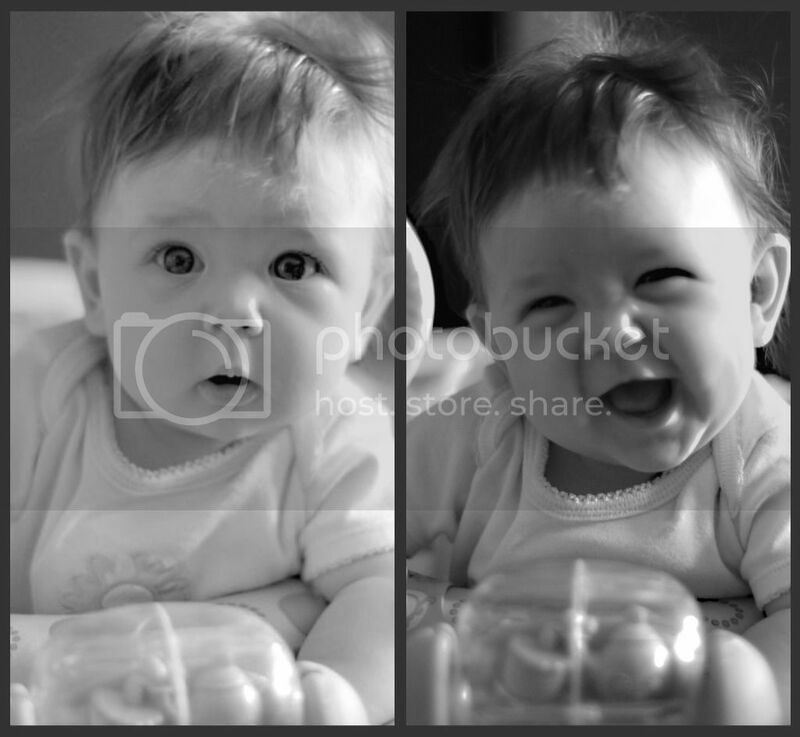 It’s impossible to look at these pictures and not break out in a huge grin myself!! She is so stinkin’ cute!! Beautiful baby, Kristen!! .-= Les in NE´s last blog ..Mailbox Monday =-. .-= Srivalli´s last blog ..Memories the Essence of Life ~ Best of 2009! =-. .-= Sailu @ Kids Recipes´s last blog ..Mango Pineapple Juice =-. Previous PostPrevious Wordless Wednesday – So Long Summer! Wordless Wednesday – So Long Summer! Sailu @ Kids Recipes on Jealous Much? Becky on Coupon Cutting Solutions?